Even minor mistakes in medical practice can have disastrous consequences. After a misdiagnosis or surgical error, some patients will be left facing multiple corrective procedures and years of rehab. Many medical malpractice victims find themselves unable to work and are forced to burn through personal savings just to support their families. The road to recovery is long. Thankfully, New York State law is unambiguous. When a medical professional’s negligence leads to serious harm or wrongful death, victims of medical malpractice have every right to secure financial compensation. Proving that a medical professional was negligent, however, can be difficult. In fact, medical malpractice may be the most complex area of personal injury law, requiring extensive knowledge of both medical and legal issues. the doctor violated that duty – rather than following accepted standards of care, the doctor deviated from those standards in some way. the doctor’s violation was the proximate cause of patient harm – a “proximate cause” is one without which the patient would not have suffered harm. To understand this concept, attorneys use the “but for” test – “but for” the doctor’s violation of medical standards, the patient would not have suffered injuries. In an actual lawsuit, proving these three elements becomes highly-specific, unique to the facts of each case. The accepted standard of care, for example, will depend on particular circumstances, like the patient’s age and medical condition, along with the healthcare professional’s specialty and resources. Our attorneys rely on the testimony of medical experts to understand what a reasonable, competent health professional would have done under the circumstances. Most negligent healthcare professionals don’t intend to hurt their patients. Where malpractice claims are concerned, that doesn’t matter. Negligent care is negligent care, no matter how helpful a doctor or nurse was trying to be. In fact, intention doesn’t (usually) enter the equation in medical malpractice lawsuits. What we’re concerned with are violations of the standard of care, whether intentional or not. Despite their differences, each of these forms of negligence rests on a simple truth: a medical professional violated the standard of care and someone was hurt or killed. Violations of the standard of care fall into two general categories: commission and omission. In cases of commission, a doctor did something that a reasonable, competent doctor would not have done. In cases of omission, the doctor failed to do something that a reasonable, competent doctor would have done, like failing to refer a patient to the appropriate specialist or failing to order a necessary diagnostic test. Malpractice laws apply to all health care professionals, not just family doctors or surgeons. Nurses, diagnostic technicians, physical therapists, pharmacists, dentists, hospital employees and entire hospital systems can also be held liable for patient injuries in court. New York, like every other state, places a time limit on personal injury lawsuits, including claims filed over medical malpractice. This law is called a “statute of limitation,” and it applies to cases of medical malpractice, dental and podiatric malpractice and lawsuits involving nurses, physician’s assistants, hygienists and any other healthcare professional. In New York, the statute of limitations on medical malpractice is 2.5 years, or 30 months. When that clock actually starts ticking is a little more complicated. For most cases, the statute of limitations will begin running on the date of actual malpractice, the day when a doctor or other healthcare professional committed a negligent act or omission that led to a patient’s injury. Waiting to file suit can be a bad idea. If the statute of limitations runs out before you establish your legal rights, you will lose the opportunity to bring a lawsuit. Take too much time and you no longer have a case – no matter how valid your allegations. In a select number of cases, however, patients will be able to file a medical malpractice lawsuit within 30 months of their last treatment – as long as that treatment was part of a continuous treatment plan for the illness, injury or medical condition that brought about the alleged malpractice event. In other states, lawmakers have established “discovery rules,” which can extend the statute of limitations for some patients. In essence, a discovery rule gives you extra time if there was no reasonable way for you to discover the injury or harm (or its relationship to possible malpractice) within the normal time limit. 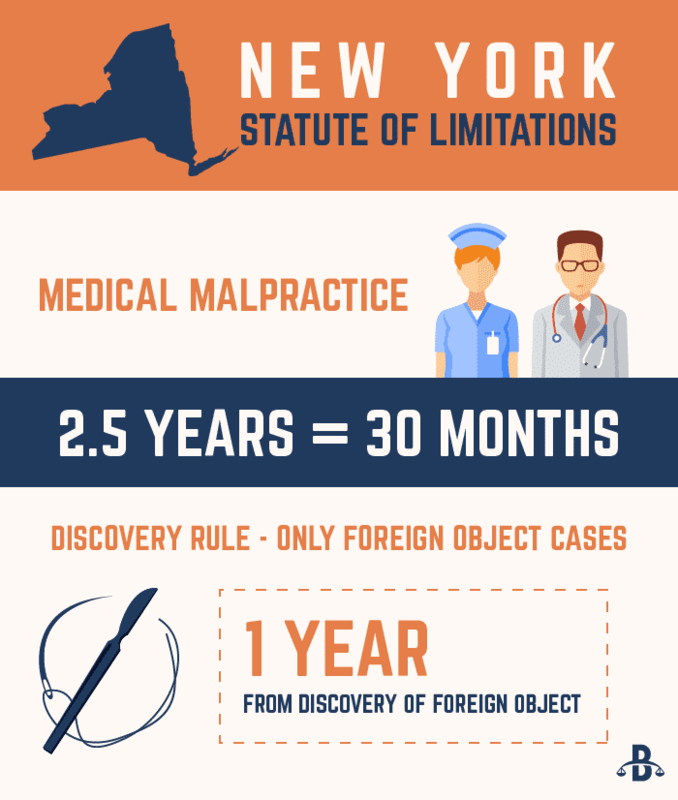 New York has a discovery rule, but it only applies to one sort of medical malpractice case: claims involving a foreign object that was left inside a patient’s body. In these cases, patients have up to one year from the date they discovered – or should have discovered – that the foreign object was accidentally left inside. Every other malpractice case has to abide by the 2.5 year rule, which begins running on the date of malpractice or the end of a continuous treatment regimen. Cases involving children are handled differently than cases involving adults. When a child is harmed by medical malpractice, the statute of limitations begins on their 18th birthday. It’s the same amount of time – 2.5 years – but it starts when the victim turns 18. Obviously, this rule can extend the statute of limitations considerably, but there is a limit. Malpractice claims for children in New York can’t be filed more than 10 years after the malpractice event occurred, or the misplaced foreign object was discovered. That’s true no matter how young the child was at the time of malpractice. Thus some claims involving very young children will need to be filed prior to their 18th birthday, and before the statute of limitations begins to run. In these cases, courts often grant an extension of the statute of limitations, at their own discretion. To eliminate “frivolous” lawsuits, ones that have no legal merit, New York State has imposed an additional requirement on filing medical malpractice claims. In effect, the court wants you to provide some evidence – prior to actual litigation – that malpractice likely took place. This requirement doesn’t apply to patients who pursue a malpractice claim without legal counsel. Lots of states limit – or “cap” – the amount of compensation a person can win in medical malpractice lawsuits. Sometimes, these damages caps only apply to specific types of damages. In New Jersey, for example, patients can’t be awarded more than $350,000 in punitive damages or five times the compensatory damages award, whichever is greater. New York doesn’t have a damages cap for medical malpractice lawsuits, even on punitive damages, which are intended as a form of punishment in cases of particularly reckless negligence. That’s probably why New York is home to the highest medical malpractice settlements in the country. In 2015, patients in New York secured over $300 million in compensation, more than in any other state. Only one other state even came close: Pennsylvania. If you or a loved one were injured, and believe that those injuries were caused by medical negligence, we urge you to contact our experienced attorneys immediately for a free consultation.